Controversial Cricket West Indies president Dave Cameron has lost a vote to remain in the post, the governing body announced Sunday. Cameron was defeated eight votes to four by Ricky Skerritt, a former West Indies team manager in a ballot conducted in Kingston, Jamaica. Skerritt's running mate Dr Kishore Shallow, who challenged Emmanuel Nanthan for the vice-presidency, won by the same margin. "I am humbled and deeply honoured to be elected as president," said Skerritt in a CWI statement. "We pledge to work for improvement on and off the field for West Indies cricket." Cameron's six years as president were marked by a series of high-profile rows with several senior players, including Chris Gayle and Darren Sammy. The 47-year-old Jamaican administrator also came under fire for his role in the sacking of Phil Simmons as head coach of the West Indies men's team in 2016. 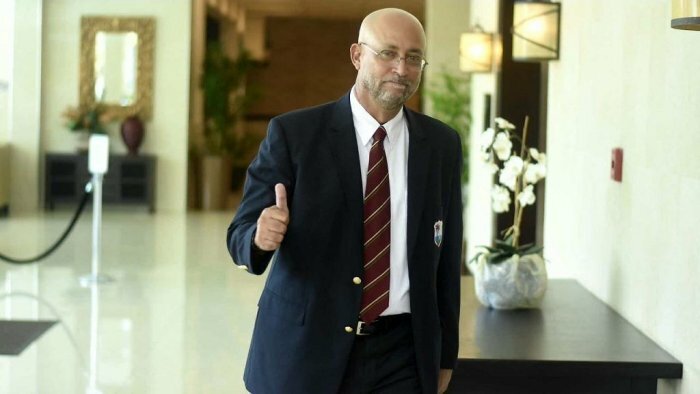 Simmons, a former West Indies batsman who is now the coach of Afghanistan, has since launched legal action against CWI for constructive dismissal. In the run-up to Sunday's elections, CWI issued a statement detailing Cameron's expense arrangements following Skerritt's claim his time in charge had caused "significant damage" to the board in both financial and reputational terms. Four years ago, the West Indies abandoned a tour of India following a pay dispute and in 2016 Sammy, the then captain of the side, publicly questioned CWI policy following the team's victory in the 2016 World Twenty20 in India. But Cameron and Nanthan defended their record in a joint statement. "We were glad to be able to serve and proud of our achievements," they said. "We are happy that we left 123 players under contract. West Indies Cricket now has a home owned by the board at Coolidge Cricket Grounds (in Antigua). "The world championships and bringing back the Wisden Trophy (which the men's team regained by beating England in a recent home Test series) are also other achievements that we are proud of."